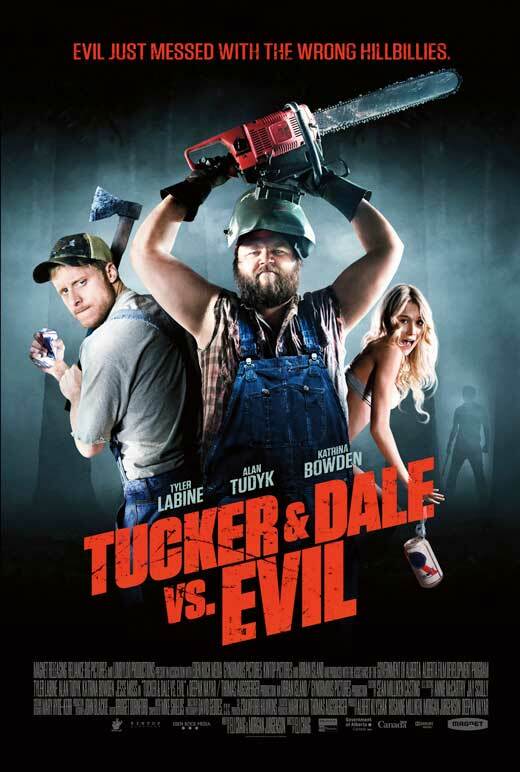 John’s Horror Corner: Tucker and Dale versus Evil (2010), a wonderfully funny and chunkily gory horror-comedy. MY CALL: Some movies just work and this is one of them. If you love horror then you must watch this one in which the perspective is hilariously reversed through the eyes of the killers…or are they the killers? Director Eli Craig must have a PhD in Sam Raimiology! [A] IF YOU LIKE THIS, WATCH: Want more funny and gross-out goretastic? Drag Me to Hell (2009), Piranha 3D (2010), Final Destination 5 (2011), The Cabin in the Woods (2012) and Piranha 3DD (2012). The set up is a lot like the recent installments of The Texas Chainsaw Massacre, Wrong Turn and The Hills Have Eyes franchises. A group of college kids go camping in the woods. 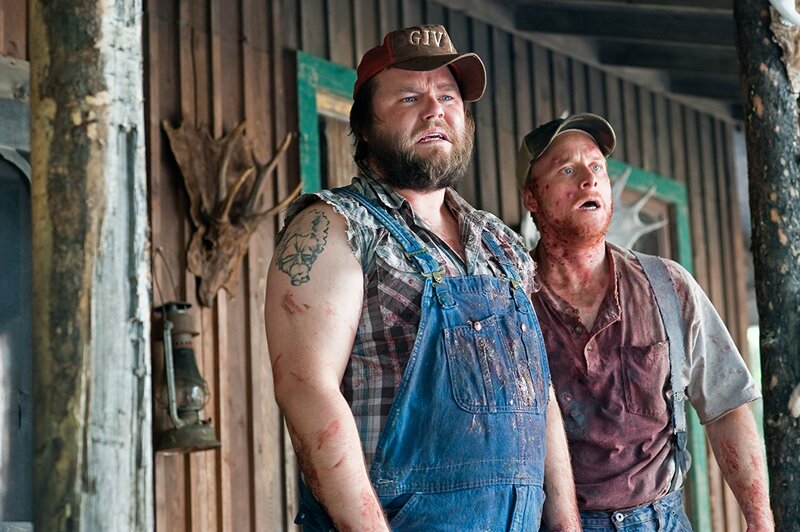 They’re unnerved by the backwoods, hillbilly-chic locals and, naturally, they suspect the worst of them. Perhaps for the first time in horror movie history, these kids’ assumptions were wrong. Tucker (Alan Tudyk; A Knight’s Tale, Serenity) and Dale (Tyler Labine; Rise of the Planet of the Apes, TV’s Mad Love) are two loveable, kind-intentioned idiots excited about a bro-mantic fishing trip. Their interactions with our teenage campers—the victems of a typical horror set up—are misconstrued such that they appear to have performed malevolent deeds. After nearly drowning, Ally (Scream Queen Katrina Bowden; Piranha 3DD) is rescued by Tucker and Dale. But when they pull her into their boat and yell “we have your friend” to the others, it is perceived that they “took” her and then cruelly goaded them. Naturally, when Ally regains consciousness, she thinks she’s been abducted. Just from the trailer I think everyone knew that this would just “work” on film. This was Eli Craig’s first job as director (and writer) and I’m itching to see what he does next. He took a smart comic premise and peppered in some solid doses of Sam Raimi-esque ultra-gore. As the kids try to “rescue” Ally from her “captors” they are accidently killed under silly circumstances delivered with perfect timing to the horror of Tucker and Dale. A true horror hound, I tend to laugh at many of the kills in serious horror flicks. But this movie invites all to join in the laughter as mulched entrails shower over the face of a mortified friend. American Psycho and the Scream franchise may have mastered the slasher movie satire. But this stands out as more of a paramount slasher movie farce, much as Shaun of the Dead was for zombie fare. Yes! I’ve heard a couple friends of mine specifically compare it to Cabin (and that they’re a perfect double feature). They really complement each other well in their approaches.